Network log analysis is a common practice in many organizations. By capturing and analyzing network logs, you can learn how devices on your network are communicating with each other, and the internet. There are many reasons for performing log analysis, such as audit and compliance, system troubleshooting, or security forensics. 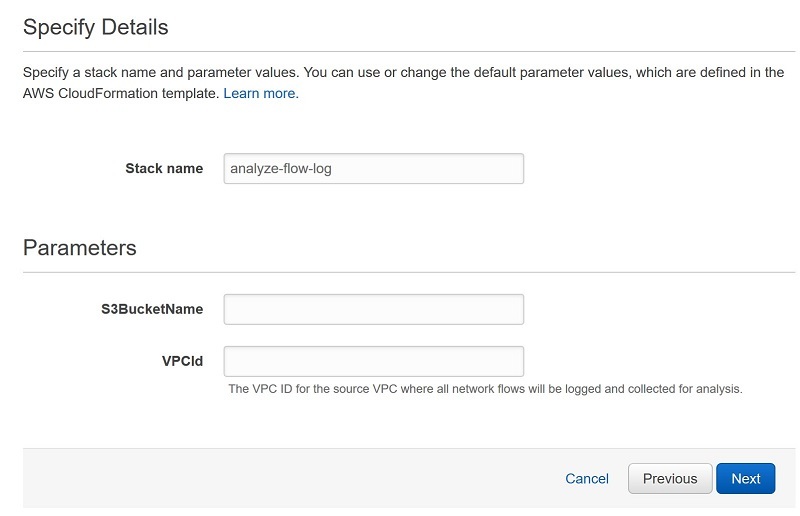 Within an Amazon Virtual Private Cloud (VPC), you can capture network flows with VPC Flow Logs. You can create a flow log for a VPC, a subnet, or a network interface. If you create a flow log for a subnet or VPC, each network interface in the VPC or subnet is monitored. Flow log data is published to a log group in Amazon CloudWatch Logs, and each network interface has a unique log stream. 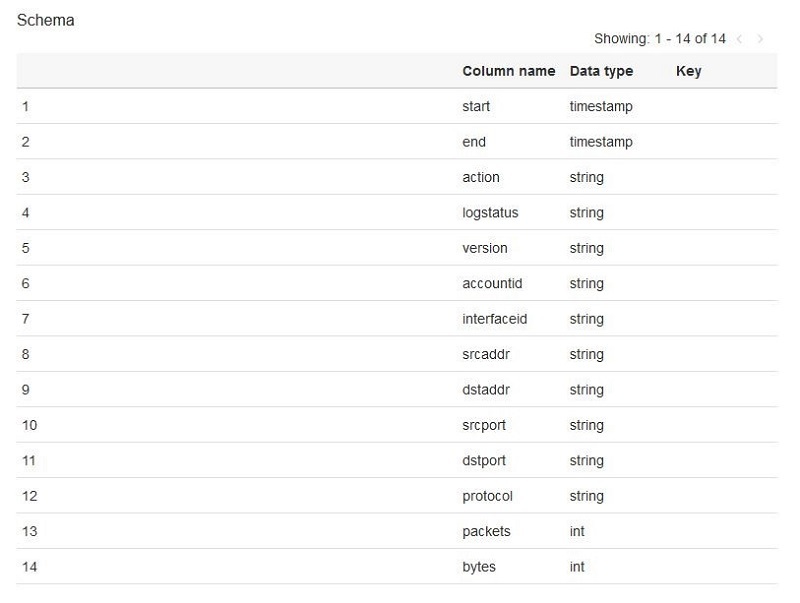 CloudWatch Logs provides some great tools to get insights into this log data. However, in most cases, you want to efficiently archive the log data to S3 and query it using SQL. This provides more flexibility and control over log retention and the analysis you want to perform. But also, you often want the ability to obtain near real-time insights into that log data by performing analysis automatically, soon after the log data has been generated. And, you want to visualize certain network characteristics on a dashboard so you can more clearly understand the network traffic within your VPC. So how can you accomplish both efficient log archival to S3, real-time network analysis, and data visualization? This can be accomplished by combining several capabilities of CloudWatch, Amazon Kinesis, AWS Glue, and Amazon Athena, but setting up this solution and configuring all the services can be daunting. In this blog post, we describe the complete solution for collecting, analyzing, and visualizing VPC flow log data. In addition, we created a single AWS CloudFormation template that lets you efficiently deploy this solution into your own account. This section describes the overall architecture and each step of this solution. We want the ability to query the flow log data in a one-time, or ad hoc, fashion. We also want to analyze it in near real time. So our flow log data takes two paths through the solution. For ad hoc queries, we use Amazon Athena. By using Athena, you can use standard SQL to query data that has been written to S3. An Athena best practice to improve query performance and reduce cost is to store data in a columnar format such as Apache Parquet. This solution uses Kinesis Data Firehose’s record format conversion feature to convert the flow log data to Parquet before it writes the files to S3. Converting the data into a compressed, columnar format lowers your cost and improves query performance by enabling Athena to scan less data from S3 when executing your queries. By streaming the data to Kinesis Data Firehose from CloudWatch logs, we have enabled our second path for near real-time analysis on the flow log data. Kinesis Data Analytics is used to analyze the log data as soon as it is delivered to Kinesis Data Firehose. 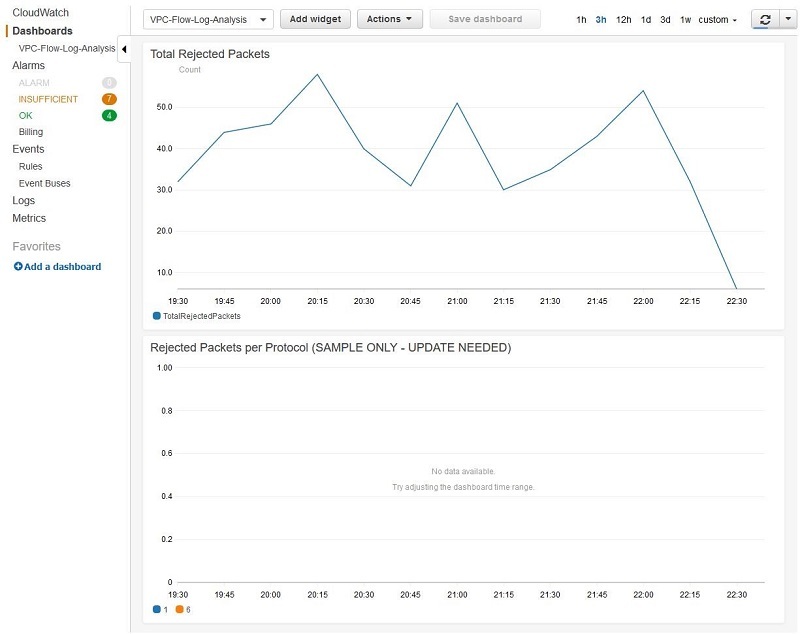 The Analytics application aggregates key data from the flow logs and creates custom CloudWatch metrics that are used to drive a near real-time CloudWatch dashboard. Let’s review each step in detail. For more information about each item in the line, see Flow Log Records. Note that VPC flow logs buffer for about 10 minutes before they’re delivered to CloudWatch Logs. CloudWatch Logs subscriptions sends data to the configured destination as a gzipped collection of records. Before we can analyze the data, we must first decompress it. There may be situations where you want to transform or enrich streaming data before writing it to its final destination. In this solution, we must decompress the data that is streamed from CloudWatch Logs. With the Amazon Kinesis Data Firehose Data Transformation feature, we can decompress the data with an AWS Lambda function. Kinesis Data Firehose manages the invocation of the function. Inside the function, the data is decompressed and returned to Kinesis Data Firehose. The complete source code for the Lambda function can be found here. 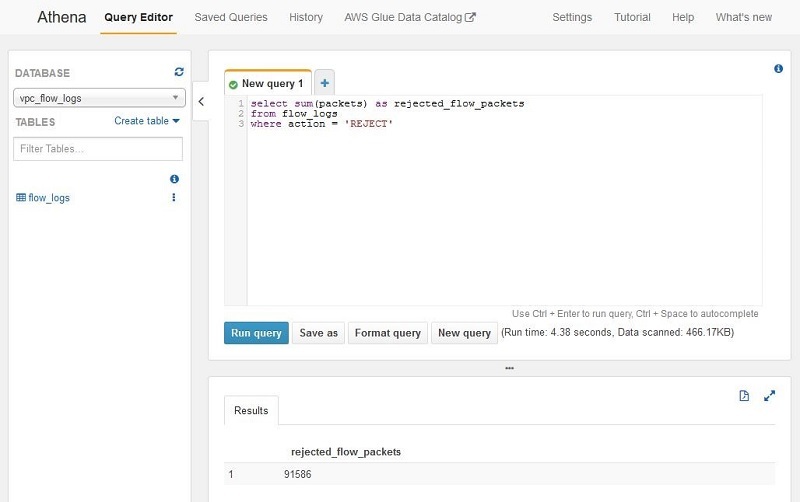 To take advantage of the performance capabilities in Amazon Athena, we convert the streaming data to Apache Parquet before persisting it to S3. We use the record format conversion capabilities of Kinesis Data Firehose to perform this conversion. When converting from JSON to Parquet, Kinesis Data Firehose must know the schema. To accomplish this, we configure a table in the Glue Data Catalog. In this table, we map the attributes of our incoming JSON records to fields in the table. When using the data format conversion feature in Kinesis Data Firehose, the only supported destination is S3. Kinesis Data Firehose buffers data for a period of time, or until a data size threshold is met, before it creates the Parquet files in S3. In general, converting to Parquet results in effective file compression. If the file size is too small, it isn’t optimal for Athena queries. To maximize the file sizes created in S3, the solution has been configured to buffer for 15 minutes, or 128 MB. However, you can adjust this configuration to meet your needs by using the Kinesis Data Firehose console. In this solution, Athena uses the database and table created in the Glue Data Catalog to make your flow log data queryable. There are sample queries to review later in this article. A count of rejected TCP packets, every 15 minutes. A count of rejected TCP packets by protocol, every 15 minutes. These metrics are aggregated over a 15-minute window. At the end of the window, KDA invokes a Lambda function, passing the aggregated values as input to the function. At the end of the 15-minute window, KDA invokes a Lambda function, passing the aggregated values. The Lambda function writes these values to CloudWatch as custom metrics. This enables the solution to support alarms on those metrics using CloudWatch alarms, and it enables custom dashboards to be created from the metrics. CloudWatch dashboards are customizable home pages in the CloudWatch console for monitoring your resources in a single view. You can use CloudWatch dashboards to create customized views of the metrics and alarms for your AWS resources. In this solution, we create a dashboard that monitors the custom aggregations created in our KDA application. The solution creates a sample dashboard to get you started, but you should review the metrics and create a dashboard and alarms to meet your needs. The Create Stack wizard for CloudFormation will be opened. The template location is pre-populated. Click Next, and you will prompted to provide values for several template parameters. Stack name — The name for this CloudFormation stack. You can rename it from the default, but choose a short (up to 16 characters) name, and ensure your name uses only lower-case letters. The value you use here will be used as a prefix in the name of many of the resources created by this stack. By providing a short name with lower-case letters, the names for those resources will pass the resource naming rules. S3BucketName — The name of the S3 bucket into which the Parquet files are delivered. This name must be globally unique. VPCId — The ID of the existing VPC for which flow logs are captured. Choose Next, and accept any defaults for the remainder of the CloudFormation wizard. The stack is created in a few minutes. After the stack has been deployed, it may take up to 15 minutes before data can be queried in Athena, or viewed in the CloudWatch dashboard. Let’s look at a few sample queries you can run in Athena to learn more about the network traffic within your VPC. This example shows that the value for the protocol box follows the standard defined by the Internet Assigned Numbers Authority (IANA). So in the previous example, the top two rejected protocols are TCP and ICMP. This example shows that the Rejected Packets per Protocol chart has been created to plot only a subset of all possible protocols. Modify this widget to show the protocols that are relevant for your environment. Create partitions in the Glue table to help optimize Athena query performance. The current solution creates data in S3 partitioned by Y/M/D/H, however these S3 prefixes are not automatically mapped to Glue partitions. This means that Athena queries scan all Parquet files. As the volume of data grows, the Athena query performance degrades. For more information about partitioning and Athena tuning, see Top 10 Performance Tuning Tips for Amazon Athena. Apply the solution to additional VPCs, or in different regions. If your account contains multiple VPCs, or if your infrastructure is deployed in multiple Regions, you must create the stack in those Regions. If you have multiple VPCs within the same Region, you can create a new flow log for each additional VPC by using the VPC console. Configure the flow log to deliver to the same Destination Log group that you created with the stack was initially created (CWLogGroupName parameter value in the CloudFormation template). Modify the default widgets in the CloudWatch dashboard. The stack created a couple of default CloudWatch dashboards; however, you can create more to meet your needs, based on the insights you’d like to get from the flow logs in your environment. 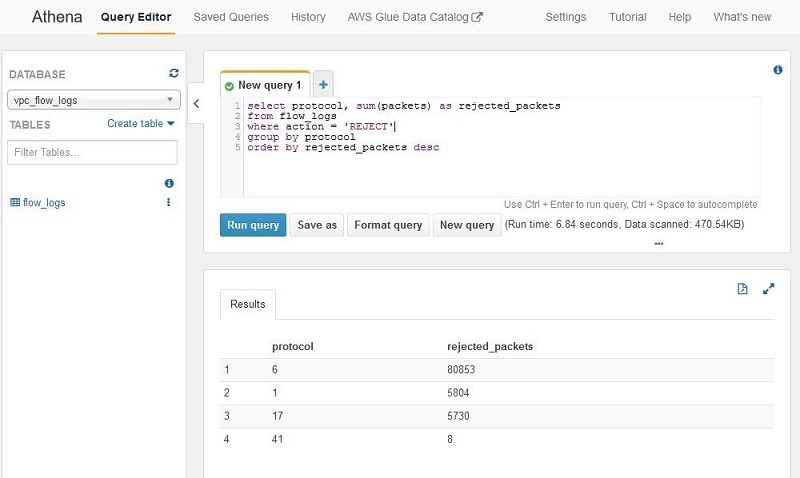 Create additional queries in Athena to learn more about your network behavior. Using the solution provided in this blog post, you can quickly analyze the network traffic in your VPC. It provides both a near real-time solution, and also the capabilities to query historical data. You can get the most out of this solution by extending it with queries and visualizations of your own to meet the needs of your system. 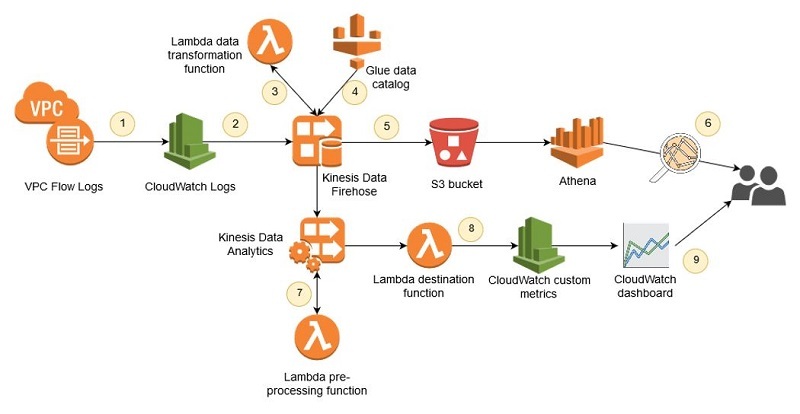 If you found this post useful, be sure to check out Analyze Apache Parquet optimized data using Amazon Kinesis Data Firehose, Amazon Athena, and Amazon Redshift and Preprocessing Data in Amazon Kinesis Analytics with AWS Lambda. Allan MacInnis is a Solutions Architect at Amazon Web Services. He works with our customers to help them build streaming data solutions using Amazon Kinesis. In his spare time, he enjoys mountain biking and spending time with his family.